The Romanian War of Independence was battled in 1877. It was against the Ottoman Empire. On April 16 [O.S. 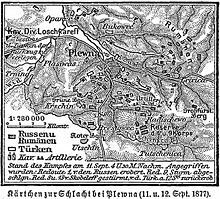 April 4] 1877, Romania and the Russian Empire signed a treaty that allowed Russian troops to pass through Romanian land, so long as the Russians respected the integrity of the Romanians. On May 21 [O.S. May 9] 1877, in the Romanian parliament, Mihail Kogălniceanu said that it was the will of the Romanian people to be independent. In the beginning of this war, Russia did not want to help the Romanians with the war. Soldiers in Grey are Romanians and in blue are the Turks. The Romanian Army defeated the Turks in all the battles. The battles took place in Grivitsa, Rahova, Vidin and Smârdan. This page was last changed on 13 August 2018, at 17:14.